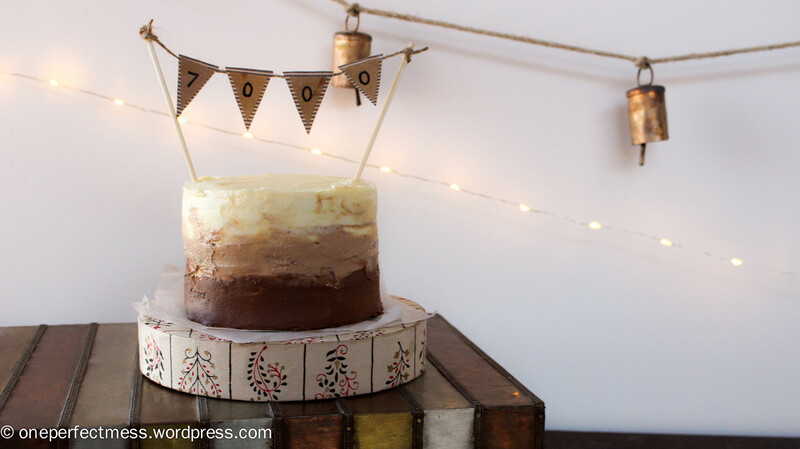 7000 views later and a small but swanky little creation to celebrate; three layers of fudgey, rich, chocolate buttermilk cake, stacked between slatherings of silky chocolate swiss meringue buttercream. If there’s one thing I enjoy more than chocolate swiss meringue buttercream, it’s a collaboration of white, milk and dark chocolate swiss meringue buttercream all in the one cake. The buttermilk cake is soft and moist, and has very little sugar and lots of cocoa so is quite intense, perfectly offsetting the sweetness of the frosting. 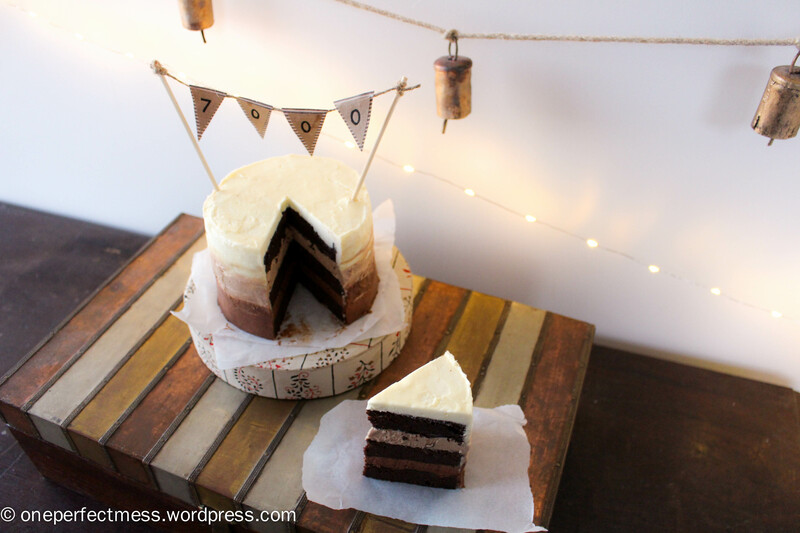 This mini cake is perfect for 4-6 people, and isn’t an excessive baking endeavour like many of my other layer cakes. Although the swiss meringue buttercream requires about an hour of tender loving care, once made it’s too easy to create the three chocolate variations and slather it all on the cake. Don’t be too meticulous about achieving the ombre effect, the less you touch the cake the better it will look! Preheat oven to 160°C/320°F fan-forced. Grease and line one 12 cm/5 inch cake tin. Combine the water, butter and cocoa in a medium saucepan over medium heat, and stir gently until the butter has just melted. Sift the flour, baking soda and sugar into a large mixing bowl. Pour in the cocoa mixture, egg, buttermilk and vanilla, and whisk gently by hand until the ingredients are combined and the batter is smooth. Do not over-whisk, only until the dry ingredients are just incorporated into the wet. Pour the mixture into the tin, and use a spatula to smooth the surface. Bang the tin a couple of times on the counter. Bake the cake on a central rack for 40-50 minutes, rotating halfway to ensure even baking. The cake is cooked when a metal skewer inserted into the centre comes out clean but moist, with a few crumbs but no wet batter. Allow the cake to cool in the tin on a metal rack for 20 minutes, then use a large chopping board to turn the cake out and leave to cool completely. Use a sharp serrated knife to cut off the domed top, and slice the cake into 3 even layers. Brush off any loose crumbs and refrigerate until ready to frost. This will slightly firm up the layers and give you better stability when frosting. In a large heatproof bowl over a pot of simmering water, gently hand-whisk the egg whites and sugar until sugar has just dissolved and mixture appears white (about 5 minutes). Alternatively, use a candy thermometer to whisk until temperature of mixture reaches 70°C/160°F. Ensure you whisk gently but constantly, so that the egg whites do not cook. Transfer mixture to the large bowl of an electric mixer, and whisk on medium/low speed until meringue is very thick and glossy and holds its peaks, and the bowl feels neutral to touch. It is very important that you whisk until the bowl no longer feels warm, otherwise the butter will melt when added. Whisk for 10-15 minutes, and if the bowl is still warm, turn mixer off and allow meringue to cool further. This will ensure you do not over-whisk meringue. Double check the temperature of the meringue by turning off the mixer, and dipping a clean finger into the centre of the meringue. It should feel room temperature. Meanwhile, melt the three chocolates in the separate heatproof bowls either in the microwave, or over pots of simmering water. Set aside until just cool enough to dip your finger into, this should take about 10 minutes. Once all of the butter is added to the buttercream, continue beating on a low speed for a minute or two. The buttercream should be thick and glossy. If it is too thin, the butter was too soft when added, so refrigerate buttercream for 15 minutes to firm up and then continue beating. If it appears too thick or scrambled (literally like scrambled eggs!) the butter was too cold when added, so keep beating on low speed until buttercream is smooth. Add the vanilla and salt and beat to combine. Divide the buttercream into 3 bowls. Add one type of chocolate to each bowl, stirring vigorously with a metal spoon to combine before the chocolate sets. 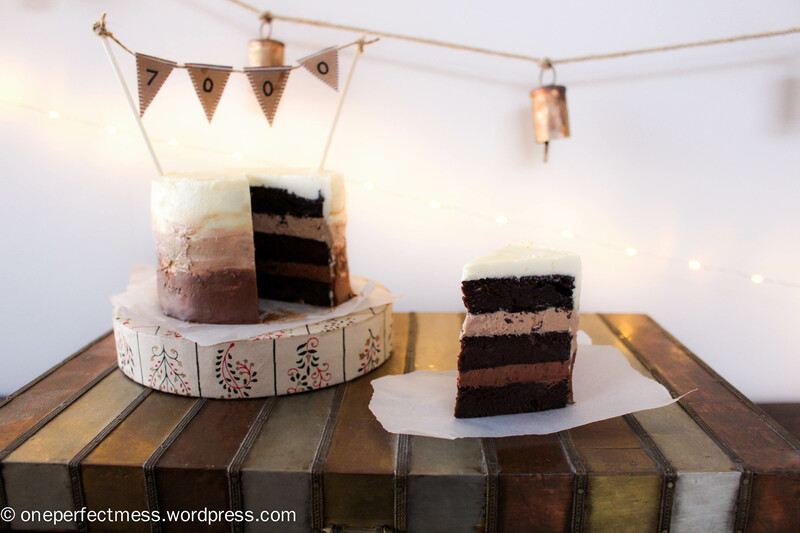 Using a small offset spatula or butterknife, anchor the base layer to your plate, and frost the first 2 cake layers together using the dark chocolate buttercream, then add the third layer using the milk chocolate buttercream. Refrigerate for 10 minutes. Scrape off any excess buttercream spilling out from between the layers, to smooth the outer surface of the cake. Using a little of the white chocolate buttercream, frost a crumb coat over the entire cake. This is a very thin coat, and you should be able to see the cake through the buttercream. It forms a seal around the cake so you don’t get crumbs in your pretty frosting! Refrigerate the cake for another 10-15 minutes, until buttercream is firm to touch. Frost the outside of the cake by starting from the bottom with the dark chocolate buttercream, working 1/3 of the way up the sides of the cake. Repeat around the middle 1/3 with the milk chocolate buttercream, trying to keep it separate from the dark chocolate. Finally, frost the top surface with the white chocolate buttercream, then spread it down the top 1/3 of the sides. Refrigerate for another 10 minutes. You won’t need all of the buttercream, try and keep the coating under 1 cm thick. It’s helpful to have a little extra to touch up any botched areas later. 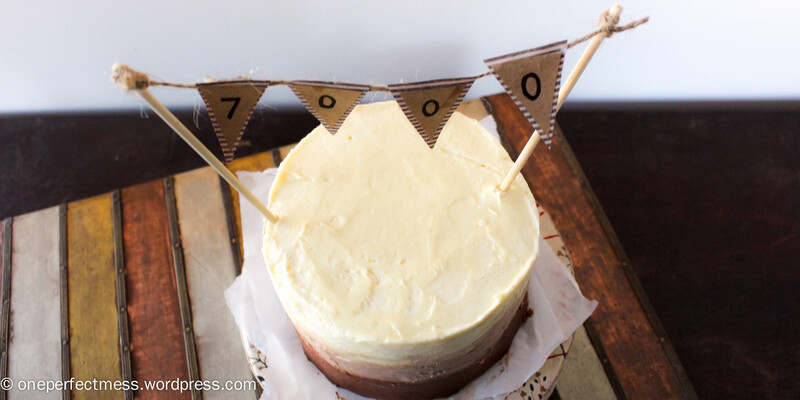 Using a benchscraper or butterknife, smooth the surfaces of the cake and subtly blend the shades of frosting together. Work slowly, and wipe your knife with paper towel after each spread to keep it clean and avoid over-mixing the shades. Don’t be too meticulous, the less you touch the cake, the better it will look! Store the cake covered and refrigerated for up to 5 days, but best served within 1-2 days of baking. Bring to room temperature for at least 30 minutes before serving. Note: The cake can be made up to 2 days in advance, and stored in an airtight container. Swiss meringue buttercream can be refrigerated in an airtight container for up to one week, or frozen for up to 6-8 weeks. Before using it to frost your cake, allow it to cool to room temperature, then beat on medium speed using an electric mixture until it retains its silky, soft consistency. This can take up to 20 minutes, so be patient if the texture looks a little strange. For ease, if possible prepare the SMB immediately before you frost your cake.